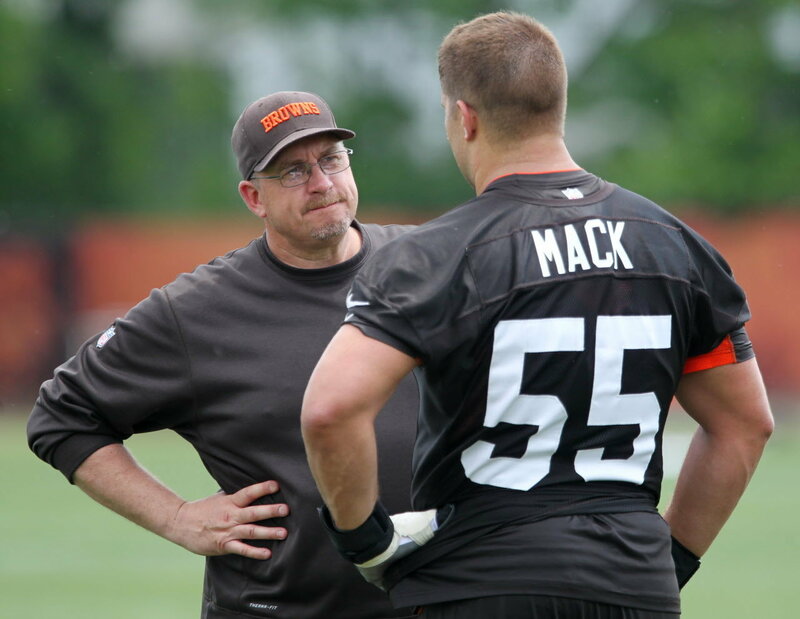 2014 was Andy Moeller's first season as offensive line coach with the Browns after spending the previous 6 years guiding the Ravens’ offensive linemen, including earning his first Super Bowl ring following the 2012 season. Andy has has be entrusted with coaching some of the best in the NFL, including perennial Pro Bowlers Joe Thomas and Alex Mack in Cleveland, and two-time Pro Bowl G Marshal Yanda while in Baltimore. In 2012, the Ravens scored the most points(398) in single-season franchise history, also posting the second-most total yards (5,640) in a season.Baltimore set another team record in 2012 by surrendering a single-season low 16 turnovers. RB Ray Rice earned his third Pro Bowl in 2012, after tallying 1,621 yards from scrimmage (ninth in NFL), his fourth-straight season with at least 1,600. In 2011, Baltimore’s offense was 12th in scoring (23.6 ppg), seventh in third-down offense (42.4%) and 10th in rushing (124.8 ypg). Also in 2011, Rice led the league in yards from scrimmage (2,068). In 2009, the Ravens set a team record with 22 rushing TDs and tallied three of Baltimore’s then-four best offensive total yard outputs. In 2008, Baltimore was the NFL’s fourth-ranked rushing team (148.5 ypg). Prior to the Ravens, Moeller coached at Michigan from 2000-2007. From 2004-07, 11 of 25 All-Big Ten first-team selections along the O-line were Wolverines…Michigan was the only team to have multiple first-team All-Conference selections during that five-year stretch. 2004: O-line was anchored by C David Baas, the co-recipient of the Rimington Trophy as the nation’s outstanding center…Baas earned consensus All-America honors and was named the Big Ten Offensive Lineman of the Year after switching from guard to center…RG Matt Lentz and LT Adam Stenavich received All-Big Ten first-team honors, with RT Jake Long collecting second-team accolades. 2003: O-line was among the nation’s best, balancing a strong running game led by All-America tailback Chris Perry and the passing arm of All-Big Ten first-team QB John Navarre…Offense set school records for total offensive plays (1,014) and yards (5,807)…Moeller’s O-line helped pave the way for 1,000-yard rushers in five out of six years: twice by 2003 Doak Walker Award winner Perry (2002-03) and three times by Michigan’s all-time leading rusher Mike Hart (2004, 2006-07). 2002: Named offensive line coach. 2001: As Wolverines OTs/TEs coach, Moeller led another strong group…TEs unit caught 52 passes for 471 yards and 3 TDs. 2000: Tight ends overcame an opening-game injury to co-captain Shawn Thompson to produce another solid collective season, both in pass-catching and run-blocking…Hired to coach OTs and TEs. While at Missouri from 1994 to 1999, Moeller coached the Tigers’ O-line (97-99)…Ranked among the nation’s top 10 in rushing yards per game during that span…Mizzou had three offensive linemen earn All-Big 12 first-team honors in the three years…Was also promoted to run-game coordinator during his tenure at Missouri. 1994-96: Helped coach TEs, tackles and special teams when he arrived in Columbia. 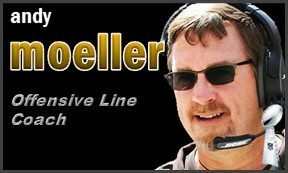 Moeller coached at Army from 1988-1993, working with the O-line, inside linebackers and special teams. Moeller launched his coaching career as a G.A. under head coach Bill Mallory at Indiana in 1987. Moeller earned a bachelor of arts degree in economics and communications from Michigan in 1987. Born June 15, 1964, Moeller has four children (Charles, Nick, Olivia, Melanie).